Famous for its red sandstone rock formations the town was named after Sedona Arabella Miller Schnebly (1877–1950), the wife of Theodore Carlton Schnebly, the city’s first postmaster. Located just 120 miles north of Phoenix, its red rocks form a popular background for many activities, ranging from spiritual pursuits to the hundreds of hiking and mountain biking and off-road trails. Home to almost 100 art galleries a large part of Sedona’s appeal is its kitschy embrace of the New Age movement which peaked in the 80’s and 90’s but is still a large part of Sedona’s Charm. 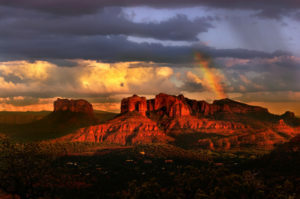 For more to see and do in Sedona please visit the following web site http://www.visitsedona.com/.